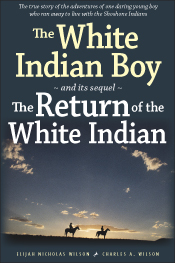 First published in 1910, The White Indian Boy quickly became a western classic. Readers fascinated by real-life 'cowboys and Indians' thrilled to Nick Wilson’s frontier exploits, as he recounted running away to live with the Shoshone in his early teens, riding for the Pony Express, and helping settle Jackson Hole, Wyoming. The volume was so popular that Wilson’s son Charles was compelled to write a second book, The Return of the White Indian, which picks up in 1895 where the first memoir ends, telling the adventures of Nick Wilson’s later life. These books, published here as a single volume, are testaments to a unique time and place in American history. Because he had a heart for adventure and unusual proficiency with Native American languages, Wilson’s life became an historical canvas on which was painted both the exploration and the closing of a frontier, as he went from childhood among the Shoshone to work as an interpreter for the U.S. government on Indian reservations in Wyoming and Idaho in his later years. This volume includes new introductory material, a family tree, and a background of Indian-white relations in Jackson Hole. Packed with amazing details about life in the Old West, Wilson’s colorful escapades are once again available to a new generation of readers. Elijah Nicholas 'Uncle Nick' Wilson (1842–1915) ran away from his Utah home and lived with the Shoshone Indians as a boy. In his later years he settled in Jackson Hole, Wyoming. The town of Wilson, Wyoming, is named for him. Charles Alma Wilson (1901–1999), the son of Elijah Nicholas Wilson, was born in Wilson, Wyoming. Like his father, Charley lived a colorful life as a rancher, government trapper, hunting and fishing guide, and author. 27. Were They Really Horse Thieves? 43. Ogden, Utah, Not in Wyoming! 49. Jackson Lake Dam-Was It Worth It?